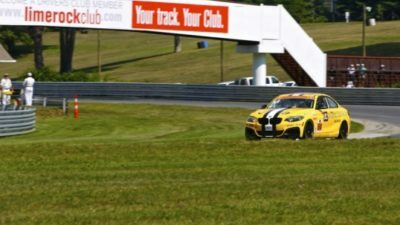 LAKEVILLE, CT (July 21, 2017) – American paralyzed BMW driver Michael Johnson is sure to be smiling a bit bigger heading into this race weekend. The 24-year-old along with co-driver Stephen Simpson placed fourth in Canada earlier this month and hope the momention of their best finish this season leads to a podium result in the Lime Rock Park 120. The IMSA Continental Tire SportsCar Challenge continues a productive summer racing schedule with this weekend’s race at Lime Rock Park in rural Connecticut. The race weekend is the seventh on the 2017 calendar with four remaining races before closing out the season. Lime Rock Park, a hamlet in the town of Salisbury, opens for practice on Fri., July 21 at 10:05 a.m., followed by an early afternoon practice and qualifications at 3:40 p.m. The two-hour Lime Rock Park 120 will be contested on Sat., July 22 at 10:25 a.m. (EDT). The race will be televised on a tape-delayed basis by FOX Sports, and but will be streamed, live, on IMSA.com. Johnson and his Street Turner (ST) class co-driver, Cape Town South Africa’s Simpson, drive a specially equipped BMW with hand controls, provided by GuidoSimplex, due to Johnson’s paralysis. The car features a complicated brake, gearshift and throttle system, with which Johnson uses his hands to control systems other drivers manipulate with their feet.